Every day in south Jersey, ordinary people have extraordinary impact on those around them. Do you know an outstanding individual? Someone who has gone “above and beyond” the call of duty by volunteering, fund raising, helping or “doing good” in southern New Jersey? We would love to feature them in our monthly newsletter. Contact Paul Blackstock to nominate someone, or for additional information. This month we bring you our 2017 Year in Review - a compilation of our favorite volunteers who went Above and Beyond the Call! Pastor Wm. Alex Guidry is our ABC (Above and Beyond the Call) for December. A California native, Pastor Alex first came to New Jersey in 1970 to attend Westminster Choir College in Princeton, NJ where he majored in Music Education with a principle in voice. In 1979 Pastor Alex accepted the Lord as his savior and acknowledged the call to preach the Gospel. He was ordained an Elder of the Church of God in 1986. 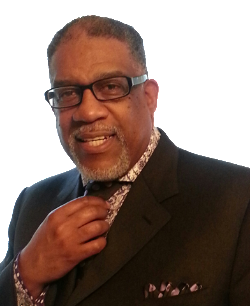 For more than 30 years he served God in various capacities on a National, Jurisdictional and local level including 10 years as a Minister of Music at Bethany Baptist Church in Lindenwold, NJ where he produced numerous choir and solo projects along with his wife Gwen whom he married in 1982. His first pastoral assignment was a church plant in 2004 in San Bernardino, CA. In 2010 after the passing of his mother, Pastor Alex and Gwen decided that it would be best to return to New Jersey and become the primary care provider for his 98 year old father, Bishop Curley Guidry, Sr. In January 2011 Pastor Alex was appointed Pastor of Healing Wings Pentecostal Temple II in Pennsville. After the passing of his father Pastor Alex would succeed his father as Pastor of the Healing Wings Pentecostal Temple in Glassboro, NJ. In his strong desire to help others in his community he has embarked on multiple community programs. Organization of the Glassboro Community Development Corp. 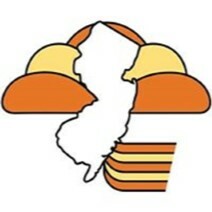 Participated in the Rowan University Federal Work Study Program, State of New Jersey Workforce Investment Board 55+ Program, and the Gloucester County Work Experience Program. Community Soup Kitchen every 4th Saturday at 11:00 am and every Wednesday at 5:30pm. Food Pantry every 2nd Tuesday from 12 noon to 4:00 pm. Providing Thanksgiving Baskets to needy local families. Summer Feeding Programs for school aged children. Off Campus Outreach Programs at Holly Bush Garden Apt, with Christmas Toy Give Away and Summer Music Program and backpack giveaway. Working with the South Jersey Food Bank as well as developing a Hot Meal program for Rowan students. He also conducts blanket drives for the homeless in Camden and monthly worship services for patients at Manor Care in Washington Twp. As you can see, he is a very busiy person. We at the Rotary Club of Glassboro are very happy that he has joined our ranks and is busy volunteering here on many different community projects. Pastor Alex, you are a Man of God that cares about all people. South Jersey is glad to have you among us as a leader and healer. Parenting is hard. But you don’t have to do it alone. We at HeartSJ believe that whether you are a single parent, grandmom or grandpop raising grandchildren, foster parent or anyone who at times has care of a child, you don’t have to do it alone. The Heart has resources to help you through our phone line, website and chatline, and our Facebook page. Below are some parenting resources where you can find parenting advice and tips. This informative, slightly irreverent forum for dads (and moms) is filled with research based facts and fun topics. You’ll find articles on Health and Science (“Why the Clocks Changing Are Great for Your Brain”), Parenting (The 19 Best Expert Parenting Tips on Talking to Kids), and Love and Money (12 Lessons I learned During My Baby’s First Year). There is also a section on “Gear” that offers everything from flash news about board game sales, to cool tools you can use to help make parenting a little bit easier (Pop Sockets—the little handle you attach to the back of your phone so little hands are less likely to drop your phone/tablet). A search on “parenting tips babies” brings up “Get your newborn sleeping through the night in 9 simple steps” (who wouldn’t want to read that!). And “parenting tips toddler” will lead you to “How to Handle a Strong-Willed Toddler”. Editor’s Note: During the groundbreaking ceremony for Camp Salute, an affordable housing development with veteran’s preference being built in Clayton, NJ, Bernadette Blackstock told the story of how she and Paul became interested in veteran’s services. We were so touched by the story of Mr. Blackstock, we wanted to share this inspiring speech with you, our readers. People often ask: Why is People for People a Veteran Preference organization, why do we do the Vets Picnic, the Wreaths of Remembrance as well as volunteering as Accredited Claims Agents at the Gloucester County Veteran Affairs office? The answer is quite simple: It is all because of a promise and commitment made to a true hero many years ago. My father-in-law JP Blackstock was the eldest son, growing up on a Georgia farm during the Great Depression. As the eldest, he wanted to help support his family, so with no jobs available, he joined the Army at the age of 23, before Pearl Harbor, so he could send his pay back home to help his family. After Pearl Harbor and the draft began, JP was already a Sargent and given the task of training young men for battle. He took these men and turned them into a fighting unit for the 4th Infantry Division that would eventually make up the landing force on D Day. At dawn on June 6th, 1944 JP and his platoon climbed down rope ladders onto landing crafts to take them ashore as the first wave of the landing on Utah Beach. JP was 28 years old. A book can be written about JP’s time in battle, but I will give you the short version. JP survived D Day and went on to fight many battles over the next month. He was awarded one of America’s highest medals the Silver Star, as well as the Bronze Star, American Defense Service ribbon, Good Conduct Metal, Combat Infantry Badge and others, AND, multiple Purple Hearts. On July 9th, 1944 at the Battle of St Low France JP was hit by a mortar blast that riddled his body with shrapnel and amputated his mouth and chin. In the heat of battle a medic took one look at the severity of the wounds and declared him KIA, Killed in Action. A body bag was placed over his body and he was sent by Jeep to the field morgue. Before doing so the Medic tore JP’s Dog Tags from his neck and wrapped them around his ankle. At the morgue a poker buddy of JP’s was preparing the bodies for transport when JP was brought in. The friends name was Charles Dwyer and he did not recognize JP because of the massive wounds. As he grabbed JP’s ankle and read the dog Tags he felt a faint pulse. Charles immediately sent JP to an Aid Station and later to a Hospital Ship. years, was confined to Military Hospitals around the country to put his face and body back together enduring over 100 operations. For the rest of his life he would be badly disfigured. Finally in 1951, JP was medically discharged from the Army and returned to Philadelphia and his new family. JP went to school upon his return and became an optician. He did so until 1972 when he retired at 56. When he got home in 1951 JP had decided to dedicate his life to volunteering for veteran causes. When asked why, he simply said that for seven years there were volunteers there for him when he needed help, now it was his turn. He held leadership positions in the VFW, American Legion, DAV, Military Order of the Purple Heart, Chapel of the Four Chaplains, and the 4th Infantry Division Pennsylvania Chapter. His disfigurement never stopped him. When someone would ask what happened, he would simply say “I forgot to duck”. 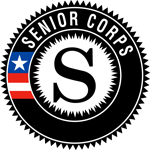 He volunteered tens of thousands of hours at the Navy Hospital and the Philadelphia VA Hospital in Philadelphia as a Veteran Service Rep and Advocate beginning in 1952. When the injured started to return from Vietnam in the 60s, he became a dedicated advocate and crusader for them and called them his KIDS. 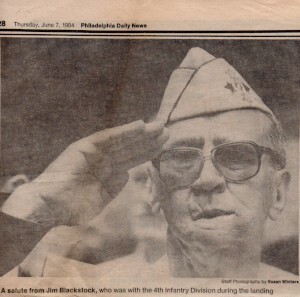 In 1984 JP was the driving force behind the Delaware Valley D Day 40th anniversary observance held at Washington Park in Philly. He asked if Paul and I could help, so we wrote hundreds of letters to every veteran organization in the tri-state area calling to arms all D Day veterans to meet in Philadelphia June 6th, 1984. We only set up a hundred chairs in the park, but by police estimates several thousand showed up closing all of center city. We moved it to the Philadelphia Navy Yard the next year. Again, the crowds were huge. The event went on every year eventually moving from the Navy Yard to Fort Dix. In 1992 we opened the event to all who served from all eras holding it at our horse ranch in Mullica Hill. Then after 9/11/2001 the event was moved to the 4H Fairground in Mullica Hill where it is still held today for free. Last year we had over 1200 people attend. At the picnic in 1998 at our home JP took Paul and me aside and told us how proud he was of our dedication to veterans, and to promise him that we will continue the picnic after he and his friends were gone. He also told us that most Veterans did not want to be honored or made special, they just didn’t want to be cast aside and forgotten. He then asked if we would one day take his place in helping and advocating for Veterans. He must have had a premonition, we lost JP a month later. 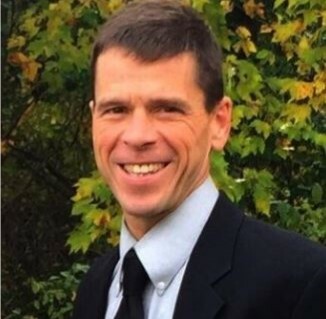 He died of injuries he received when struck by a car exiting a trolley in front of the VA Hospital on his way to volunteering yet another day. He was 82. 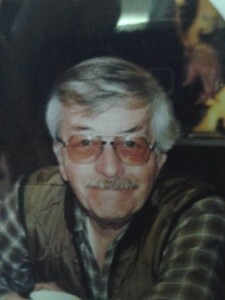 He had volunteered for veteran causes for over 46 years. So, here we are today. Camp Salute is the first of its kind community - combining permanent housing for low to moderate income families with a veteran preference, providing social services and life skill classes, an outlet and site for other veteran organizations to share, in-house experienced Volunteer Accredited Claims Agents, volunteers to assist veterans find employment and learn about their educational benefits, and much more. All of these services will not only be available to our resident veterans, but for veterans all over South Jersey - the South Jersey Veteran Resource Center. JP, we thought you would approve. 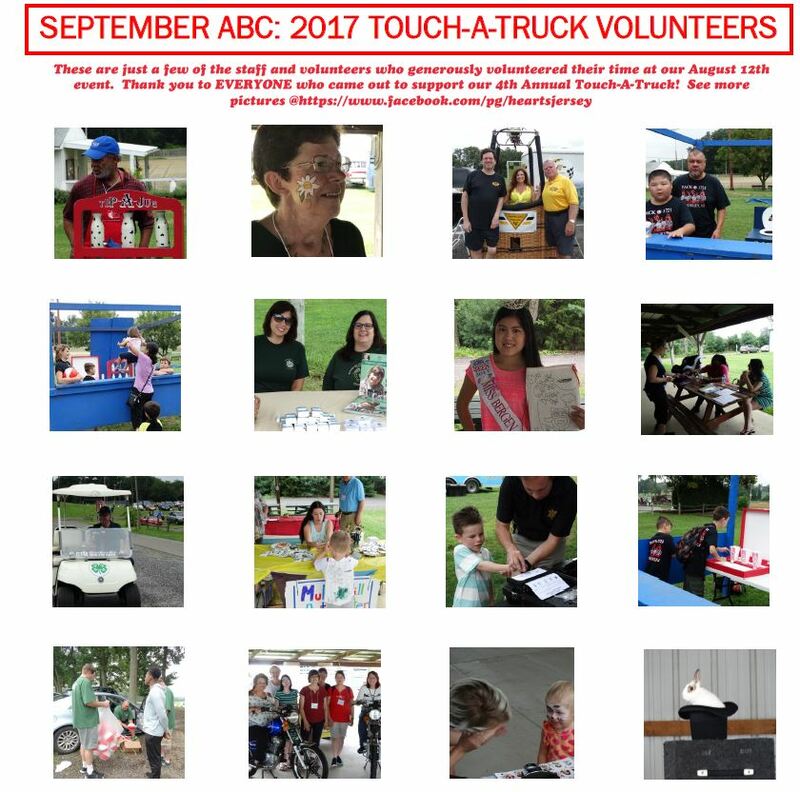 Our Above and Beyond the Call (ABC) for August 2017 is not a person, or even an individual organization, but multiple organizations, businesses, government agencies as well as community individuals willing to lend a hand by coming together as a team if a disaster strikes Gloucester County. We are not talking about “First Responders” such as the Police and Fire and EMS Departments, or even “Second Responders,” such as the Red Cross or Salvation Army, but about an organized, all-volunteer organization of area businesses, service organizations, and individuals willing to help our neighbors after a disaster strikes. This entity will be known as the Gloucester County Voluntary Organization Active in Disaster or GCVOAD. What is considered a disaster? The state’s definition is “an event that disrupts normal life, causing physical or mental trauma and damage to property and/or community infrastructure”. Disasters may include hurricane, tornado, storm, flood, wind driven water, tidal wave, tsunami, earthquake, landslide, mudslide, massive snowstorm, fire, explosions, acts of public violence or terrorism, or technological disasters involving toxic materials. And, any other event that effects multiple people and property. Gloucester County is very lucky to have the best people and resources available when it comes to providing assistance to those in need. Our local and county government officials, local Police Departments, Sheriff’s Department, local and County EMS and other “First Responders” are the best in the state. Those of us living in Gloucester County are very lucky and should be proud of these outstanding men and women. But, when a large disaster strikes, they may need our help. Almost every county in New Jersey is in the process, or already has a VOAD in place. In Gloucester County a VOAD was developed in 2002 but fell by the wayside, mostly due to the fact that we have been spared experiencing a major disaster. However, after Super Storm Sandy and Hurricane Irene, we saw what such events can do to a community. The time has come to reinstitute a VOAD in Gloucester County. The Heart of South Jersey and People for People are taking the lead with this project. They were leaders with the Long Term Recovery Group for Gloucester and Salem Counties after Super Storm Sandy and worked closely with FEMA, the Red Cross, multiple fire and police departments, businesses, and multiple other help agencies. The Heart of South Jersey also maintains a “Resource Directory” and “Help Lines” that will be utilized during disasters. More information will be made available through the Heart of South Jersey, local newspapers, radio and TV about what a VOAD is and our goals, and how you can help. VOAD encourages volunteer members to work together on a professional and personal level while following the 4 C’s: Cooperation, Communication, Coordination and Collaboration. The mission of the GCVOAD is to work together to coordinate efforts for supporting our first responders in disaster recovery in the county. Watch for more information as it becomes available. You can contact Paul Blackstock at 856-579-7561 or reach him via email at paul@pfpfoundation.org. 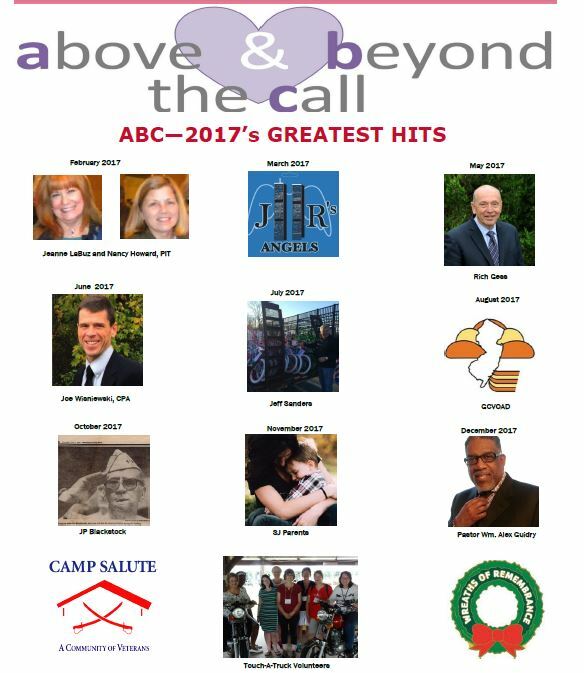 Our Above and Beyond the Call (ABC) for July, 2017 is Jeff Sanders. Jeff has held different positions in government and industry over the years as well as former Pitman Borough Councilman. Currently he is serving as the “Resource Development Director” for the Boys and Girls Club of Gloucester County. Working with young people has always been a passion for Jeff and he is now fulfilling that dream. Jeff has recently developed a 501 c 3 organization called “Pop’s Dream” that will provide new bicycles and other items to as many needy children and families as he can. He also seeks monetary donations and uses them to purchase grocery gift cards giving the child’s family the chance to buy groceries. We here at the HEART have personally seen what his efforts can do. What impresses us the most is the fire and passion he brings to the task. Hundreds of bikes and thousands of dollars in gift cards so far is just the start. Jeff’s father Grant, who worked many years in Glassboro at Owens-Illinois was an antique car enthusiast and was known region wide as an expert. Many people sought out his advice and expertise. Pop was also interested in bicycles and would fixed the bikes for the kids in the neighborhood and his reputation spread. He would also find bikes and fixed them up and then give them to needy kids in the area. It was a job of love. 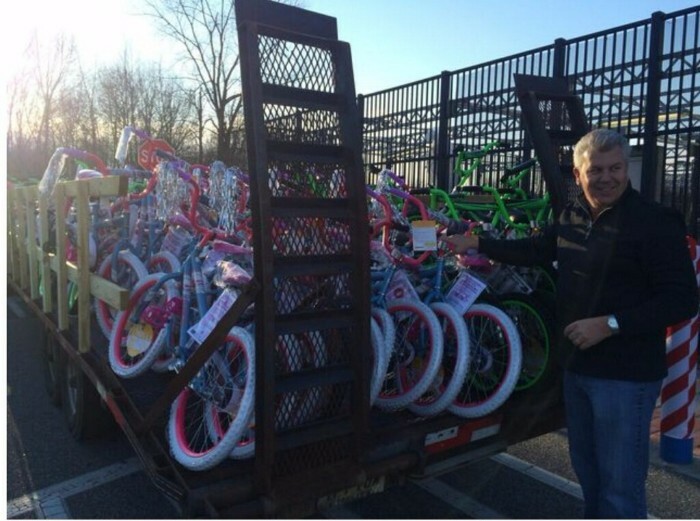 So today, Pop’s son Jeff is continuing Pop’s Dream by providing bikes for needy kids in the community. He has been able to obtain hundreds of new bikes of all sizes and shapes from multiple sources to give away through different help provider agencies and organizations across the region. As a member of the Gloucester County Chamber of Commerce Board, I was able to work with Jeff when he brought well over a hundred bikes to the Chamber’s “Breakfast With Santa” event over the past two years and much appreciated food gift cards. The look on a child’s face when they receive their first bike is amazing and the grocery gift cards bring joy to the entire family. Jeff’s goal is to exceed past efforts and he plans to extend his outreach beyond just the holiday season. He also plans to go beyond just bikes and food cards and become a year round resource provider for families and individuals demonstrating a true need for assistance. We here at the HEART are proud to call Jeff a friend and we fully support his efforts and desire to help others. Jeff is an outstanding individual who is fulfilling his Pops dream and doing a great job of it. To Jeff, we salute you and are proud to call you friend. Look up “Pop’s Dream” on Facebook or call Jeff at 609-617-5533. Our June, 2017 ABC is Joe Wisniewski CPA, a man always on the move, and for good reasons. He is an outstanding athlete and has used his energy and skills to lend a hand to Glassboro sport programs over the years. He served as a soccer referee for 8 years, soccer coach for 12 years and Little League coach for over 17 years. He still runs between 35 to 40 miles a week. For those involved in youth sports in the Glassboro area, Joe has been an inspiration to so many. But his volunteering efforts don’t stop there. He is a well-respected CPA and partner for the past 10 years with Premier Accounting Services PC in Pitman. Using his CPA skills, Joe also volunteers for multiple charities and groups. 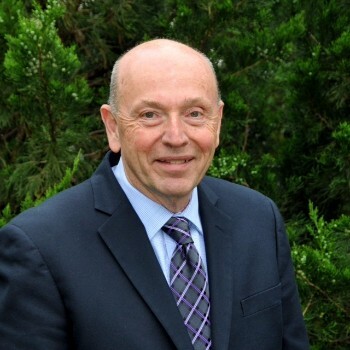 He sits on the People for People Foundation Executive Board as treasurer, volunteers his services to the Glassboro VFW and Glassboro Rotary Club, and serves on the Financial Committees for St. Bridget’s Church and St. Michael’s School in Clayton. Joe can also be seen running the parking lot for the HSJ Touch a Truck event and cooking hamburgers for our Vets Picnic, serving the BBQ dinner during the 4H Fair or giving out dictionaries to 3rd grade students in the area. And look for Joe on Memorial Day every year carrying the huge American Flag with his fellow Rotarians to close the Glassboro Memorial Day Parade. Joe is as passionate about his vocation as he is about serving others. His firm actively works with the Rohrer School of Business at Rowan University to hire accounting students for internships and contributes to their scholarship programs. He also visits local high schools to speak with young adults about the many rewarding career possibilities in the accounting services field. And then there is Joe Wisniewski the husband, father, friend, and brother. Joe is the ultimate family man married for 28 years to his wonderful wife Kathy, and raising two very impressive sons. He’s also has 10 siblings that he remains close with. He is a man with so much desire to help others he’ll even give his blood. Joe is a Red Cross regular and has donated over 15 gallons of blood to help those in need. His energy, drive, and commitment to serve others is a passion he loves. We here at People for People and the Heart of South Jersey are very proud to call Joe a friend. Without his efforts and support, neither organization would be as successful as they are. Joe is indeed an inspiration to all who know him, and a true gentleman. We salute you. Our Above and Beyond the Call (ABC) for May 2017 is Rich Gess. Rich is a long time Glassboro resident and a recently retired Senior Director from Home Depot Corporate. He has always been involved in helping people in his community, but in retirement he will be bringing his vast knowledge and drive to give back to his community even more. His motivation for many years has been to give back to others, but in retirement that determination has intensified. Rich volunteered with the Gloucester County Habitat for Humanity Board of Directors in 2007 heading up the retail end of their ReStore initiative in Pitman. The Restore today is a big success enabling the local Habitat organization to build homes for those in our community. Rich is also involved with the People for People and Habitat for Humanity joint venture, “VETS Helping VETS” program, providing furniture to veterans most in need. Rich has attended several International Habitat Conferences and has already traveled to Armenia and Portugal to build homes, and is scheduled to go to Poland later this year. During his years with Home Depot he was also heavily involved with charitable organizations in the New York City area where he spent many hours for Home Depot and also organizations such as the Queens Centers for Progress, committed to providing services and support to children and adults who have developmental disabilities, and the New York Restoration Project founded by Bette Midler that works to restore parks and community gardens. In 2010 Rich’s wife Lora attended a meeting with People for People to discuss a new project called “Wreaths of Remembrance,” an endeavor to lay a holiday wreath on every grave site at the Gloucester County Veteran Memorial Cemetery. She took the information back to Rich and he was able to work out a deal with a nursery that manufactures wreaths at 1/3 the cost of all other suppliers. Since 2010 Wreaths of Remembrance has laid over 12,000 wreaths on veteran and family graves in Gloucester County, and Rich and Lora have been there helping every year. Without the help of Rich Gess, none of this would have been possible. Rich is also an expert amateur photographer and his pictures of the wreaths at the cemetery adorn the walls at the county Veteran Affairs Office in Sewell. What we so admire Rich for is not just the things he does for others, but his passion for helping others. He has told us that he looks forward to each day with the goal of helping others. 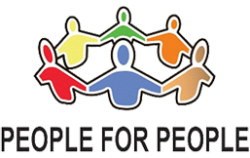 We here at the Heart of South Jersey and the People for People Foundation are honored to have him as part of our team. It is an privilege to be able to call such a man FRIEND. Well done Rich. We all remember where we were on the morning of September 11, 2001. So many of us were saddened and horrified, but for those that had loved ones in the towers it was an unimaginable nightmare. One of those families lives right here in our community. John M. Rodak of Sewell was on the 104th floor of the South Tower at his place of work and perished as a result of the attack. After the first plane hit the North Tower, John had the chance to speak with his wife Joyce by cell phone three times before all became silent. John left a loving wife and two young daughters. After the initial shock and grief of losing a husband and the girls’ father, Joyce was thrust into a heart wrenching time of loss, uncertainty and lifelong sadness. She was also overwhelmed with the outpouring of support and generosity not only from friends, but also the community. Through this support, Joyce and her daughters were able to find the strength and ability to focus on their healing and put their lives back together again. It also instilled a feeling of gratitude in Joyce for her community and the belief in human goodness. She made the commitment to herself that one day she would find a way to help and honor the community that was there for her when she needed it. In 2011, Joyce, along with family and friends, established JR’s Angels, an IRS 501 (c) to raise funds to go back into the community to assist families experiencing financial hardship, provide academic scholarships, offer help with life essentials, and contribute to other non-profits both monetarily and through volunteering. Joyce and her team feel that by providing assistance to others and participating in community service projects throughout the year, they have been able to preserve and honor John’s memory. And, they have made a positive impact in the community as a way to “pay it forward” for all the help Joyce and her family received in their time of need. Her group raises funds through an annual bowling fundraiser which was started in 2012. This year the event will be held on Saturday, April 29th, 2017 from 5:30 pm to 8:30 pm at the Brunswick Bowl in Turnersville. Help is greatly appreciated from companies and individuals that can provide lane sponsorships, gift baskets, gift certificates, or monetary donations. And, you can help as well by attending the event. If you have any questions about the event, please contact JR’s Angels at 856-256-9126. 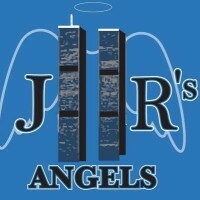 Also visit the web site at www.jrsangels.org or friend them on Facebook. JR’s Angels has touched the lives of hundreds of people and families to date through their financial gifts and volunteerism, and their dream is to continue to do so well into the future. The Heart Team is honored to work with them and call them partners and dear friends. We salute you. At the end of February 2017, we said goodbye to our friend Jeannie LaBuz who is retired after 10 years as Director, People in Transition. We welcome Nancy Howard as the incoming Director, PIT. 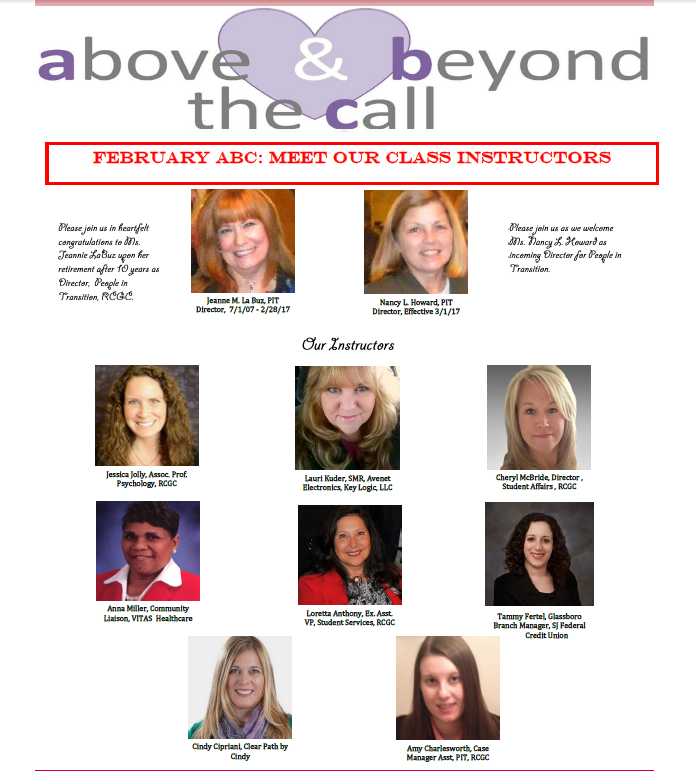 Sign up for one of our Life Skills classes - you may meet one of these very knowledgeable instructors. Some of our students have gone on to receive jobs, manage their budgets better, and even learn how to use coupons for huge savings on their grocery bill. What will you learn today?